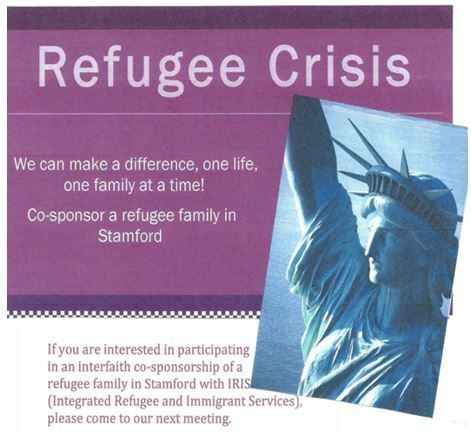 Stamford Interfaith Refugee Settlement, (SIRS), is a volunteer community group working with Integrated Refugee and Immigrant Services, (IRIS), as co-sponsors to re-settle a second refugee family in Stamford. Our goal is to help a refugee family resettle in Stamford and become self-sufficient. We are responsible for many tasks including finding and setting up housing, finding employment and securing good health care. The refugee family will need well health care and may require varying interventions depending on their particular needs. As a refugee, a person who has been forced to leave their country in order to escape war, persecution, or natural disaster, PTSD and/or other medical issues may need to be addressed. For more information, please email office@fccstamford.org.